flip the bozo bit v. Decide that someone is a clown, and stop listening to them. Once the bozo bit has been flipped, it's an almost permanent situation. Once it's on, it's on. Unflipping the bozo bit is a rare occurrence. Sometimes people annoy me and I'm tempted to flip the bozo bit on them. Even students. But I never do it. Flipping the bozo bit is the most blatant form of the ad hominem fallacy. It's counterproductive and only tears down your team. 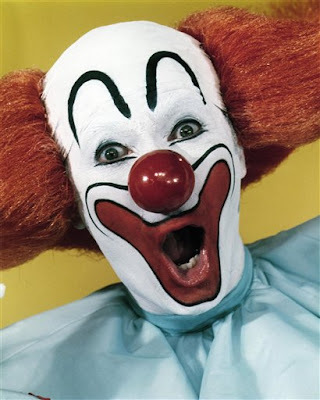 If you flip the bozo bit on someone, you basically end the relationship and create an antagonistic situation, which can be fatal to an organization, especially if the bozo bit is flipped on one of its leaders. Some of the people I've been tempted to flip the bozo bit on have turned out later to be among my most valuable team members. What If The Bozo Bit Is Flipped On You? In my two years of teaching, three students have flipped the bozo bit on me for reasons which may or may not be valid. One student just decided that he didn't like my class, so he flipped the bozo bit. Another student was stuck in the way that the previous advisor ran our organization, so she flipped the bozo bit on me. For a while, I thought Kevin flipped the bozo bit on me too, but now I don't think he actually has, although he certainly would have a reason to. If someone has flipped the bozo bit on you, should you just give up? Is it possible to regain any credibility after that point? The answer is yes, but it's very difficult. You will never be able to unflip the bozo bit yourself; only the other person can. The way to do it is to not flip the bozo bit on them in retaliation. Respect and courtesy earn courtesy and respect. If you treat people with respect and courtesy consistently and are persistent in your efforts, your bozo bit can be unflipped. But it will take some time. Don't try to get them to unflip the bozo bit – don't try to force it. Just be respectful and courteous. Most of the country flipped the bozo bit on George Bush during his last years in office. What impressed me was that he kept his chin up despite his unpopularity and despite the difficult situation he found himself in. He carried himself with grace even when the country overwhelmingly threw his party out of office. He did not get bitter. In fact, he did just the opposite. He steadfastly stayed the course with his policies, confidently made decisions, and graciously welcomed the new administration. I'll stay silent on his policies, but this aspect of his leadership style is something I admire and look up to.